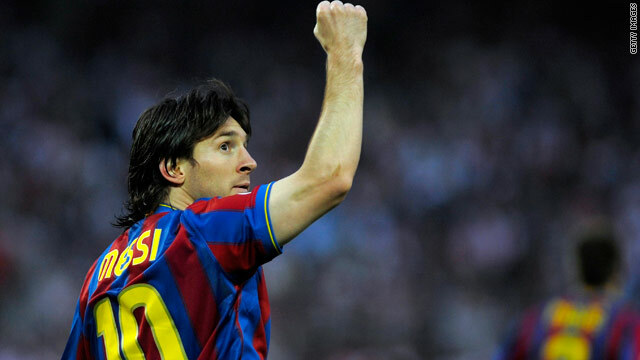 Lionel Messi celebrates his 45th goal of the season against Sevilla. (CNN) -- The battle for the La Liga title between Spanish giants Barcelona and Real Madrid will go down to the last day of the season, after wins from both teams on Saturday insured the Catalan's slender one-point lead over their rivals at the top of the division was maintained. Barcelona were in imperious form in the first half of their 3-2 away win at Sevilla, with Argentine striker Lionel Messi continuing his prolific record in front of goal, claiming his 45th strike of the season after just five minutes. Bojan Krkic extended the lead after 28 minutes, as Barca dominated the possession and passing, before Pedro seemingly put the result beyond doubt with a third after 63 minutes. But the momentum swung back to the hosts as Sevilla's Fredi Kanoute reduced the deficit six minutes later before Luis Fabiano capitalized on some sloppy defending from a free kick to leave Barca holding on anxiously during the final period. Despite accruing an astonishing points total of 96 from 37 games, Pep Guardiola's men were still not able to celebrate as champions on the final whistle as Real Madrid kept up the heat with a crushing 5-1 victory over Athletico Bilbao. The win leaves the side of Chilean coach Manuel Pellegrini on 95 points with one game left to play, though Los Merengues had to be patient for the goals to start flowing at the Santiago Bernabeu. Portugal star Cristiano Ronaldo netted from the penalty spot, his 26th goal in 28 appearances this campaign, on 22 minutes after Fernando Amorebieta was sent off for handling the ball, before Fran Yeste equalized shortly before the end of the first half. But with Barca leading in their game, Pellegrini's men knew three points would be needed to keep their title dreams alive. Real Madrid have won 17 of their last 18 games, and the men in white showed a familiar will-to-win as they applied the pressure that subsequently saw four goals scored in 16 minutes. First Higuain struck on 73 minutes, before Sergio Ramos doubled the lead. France striker Karim Benzema netted a minute later before Marcelo applied the final touches to a dominant display with a goal in the final seconds. At the bottom of the table relegation also remains undecided as three points separates the bottom five teams. Valladolid will hope to beat Barca at the Camp Nou in the last game of the season after securing a vital 2-1 win over fellow strugglers Racing Santander. Bottom-side Xerez kept their hopes alive by beating Real Zaragoza 3-2, while Tenerife's 2-2 draw with Almeria staved off the drop for another week. Malaga, after suffering a 2-1 defeat to Getafe, most hope to beat Real on May 16 if they are to avoid the fate of relegation.